The genetic improvement of livestock has been a hot topic for almost a century, bringing together researchers, industry, and producers to work towards a common goal. Many countries currently employ extensive genetic selection programs in their cattle with pigs, sheep, and chicken close behind. In this webcast, Heather J. Huson, Ph.D. from Cornell University will focus on population dynamics and trait association in cattle and goats using high density SNP datasets. Population structure plays a critical role in understanding the relatedness among livestock, ancestral origins of traits, and identification of unique sub-populations or breeds for production improvement and conservation. 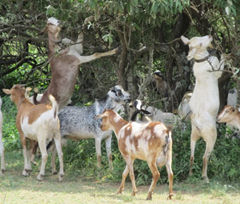 This also lays the foundation for understanding and improving species such as the goat which is a vital food source in developing countries but has little recorded production or health data. Understanding population structure is essential for designing complex trait association studies such as those related to production and health characteristics. Here, Huson shows examples of her lab's investigation into population structure in both goats and cattle to identify distinct groups and study traits such as thermo-tolerance. Heather Huson is a molecular geneticist who specializes in the use of genomic tools to identify population structure, including measures of inbreeding and the identification of genetic lineages. Her work also entails the mapping of phenotypic traits (performance, disease, morphology) to associated genetic loci, therefore identifying diagnostic markers and causative mutations for breed management. She has a diverse background in veterinary and wildlife rehabilitation as well as extensive wildlife, dog, and livestock genetics research which allows her to adapt techniques from each discipline to meet the objectives of her research projects. She spent over 25 years competitively racing Alaskan sled dogs, and a large part of her genetics research has been focused on studies of genetic ancestry and the genetic basis of performance. Her current research includes the genetic improvement of cattle and goats targeting improved productivity while maintaining local adaptation. She believe that both population and molecular genetics are essential tools in the design and implemtation of breeding programs that aim to improve and maintain the genetic health of dogs, at both the level of the individual and the breed. Heather was one of the first-place winners in Golden Helix's abstract competition.